A questionable image leak supposedly showing what a refreshed iPad Pro could potentially look like depicts an odd addition to the rear of the tablet, but at the same time also uses a design aesthetic that Apple is unlikely to resurrect in its next iPad Pro generation. The CAD illustration shared by the OnLeaks Twitter account identifies the depicted device as a 2018 iPad Pro. 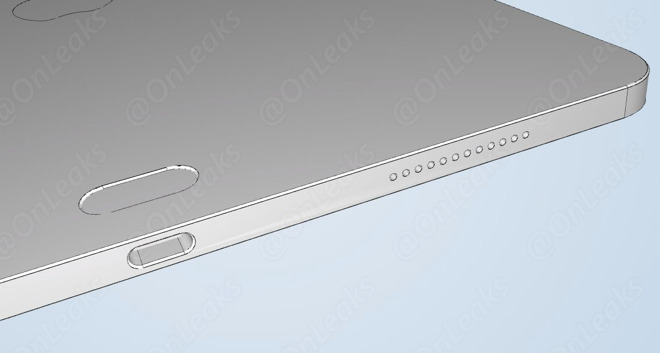 Rather than showing the entire device, the shared image shows the bottom edge of the tablet, complete with Lightning port and speaker vents and part of the traditional Apple logo. There are two notable changes to the design compared to the currently-offered iPad and iPad Pro models. The main item is a circular section of the back cover close to the Lightning port that is recessed into the casing, something that has not been seen before in Apple's tablet range. A recent report claimed the Smart Connector would be moved from its current location on the edge of the iPad Pro to a space on the "lower rear side" close to the Lightning connector. The new image seemingly suggests what this could look like, though with an oddly different shape for the connector compared to the three circular contacts in the current implementation. Another difference to current designs is the way the casing is constructed, as the image suggests chamfered edges and possibly multiple sections sandwiched together, rather than the existing one-piece backing with curved edges. It seems unlikely that Apple would revert to a more iPhone 5-style design for the casing, especially since it would likely increase the number of parts used in construction. As it is a shot from a CAD image shared on Twitter, it is almost impossible to tell if it is a genuine Apple design document or not. OnLeaks itself admits it can't confirm the file's accuracy, but states the image is share "for discussion purposes only" because of the odd details. Expected to ship sometime this fall, the 2018 iPad Pro models are speculated to have a smaller footprint but retain the screen size, bringing it closer to an iPhone X with an edge-to-edge display. Touch ID would be removed in favor of Face ID and the screen notch, as well as suggestions it would also eliminate the headphone jack.